This auction was won by m***s.
Enjoy a 7 night stay for 2 guests in a Standard Double Inland View Room at the beautiful 4 star Cosmopolitan Hotel & Spa which lies next to Katerini Beach in Greece. Stay includes: complimentary daily breakfast and dinner (excluding drinks), a bottle of wine and fruits in room on arrival, and a 30 minute relaxing massage for 2 people. Stay is valued at approximately €752 EUR / £680 GBP / $855 USD*. Please note the winner will be required to separately pay for the Occupancy Tax of €3 EUR (approx. £2.60 GBP / $3.65 USD) per room, per night in cash on arrival, as well as for any other additional purchases including further meals, drinks, spa treatments, excursions etc. Auction stay dates: to be booked in advance and taken between 29 April 2019 to 05 May 2019 or between 14 to 31 October 2019 only, subject to availability. The beautiful Cosmopolitan Hotel & Spa is found in the traditional town of Pabreathtakingi, in the region of Pieria in Greece, a natural bay with breath taking views of the Aegean sea and the Olympus mountain, where the suns shines over 200 days per year! The hotel itself lies just a 5 minute walk from Katerini Beach, offering guests affordable luxury, comfort and great service with a welcoming vibe. This modern property boasts luxury services, facilities and cutting edge technology and the nearest airport, Thessaloniki Airport, conveniently lies just an hour and a half away from the hotel. 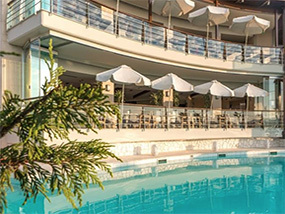 This 50 room property feature an outdoor pool, an indoor heated pool, a restaurant with a fantastic variety of Greek and international dishes, a bar, special kids area, kids pool, SPA facilities, gym room, beach area with sunbeds and umbrellas and open air parking (in front of the hotel). The winner and their guest will be staying in a 20m2 Standard Double Room with panoramic windows, furnished terrace or balcony; bathroom with bathtub or shower cabin and unlimited wifi internet access (free of charge). All rooms benefit from air conditioning, LCD flat screen satellite TV, direct dial phone, safety deposit box, mini bar (upon request), private ensuite bathroom, hairdryer and bathrobes and slippers (upon request). This 50 room property feature an outdoor pool, an indoor heated pool, a restaurant with a fantastic variety of Greek and international dishes, a bar, kids pool, SPA facilities, gym room, beach area with sunbeds and umbrellas and open air parking (in front of the hotel). The winner and their guest will be staying in a 20m2 Standard Double Room with panoramic windows, furnished terrace or balcony; bathroom with shower cabin and unlimited wifi internet access (free of charge). All rooms benefit from air conditioning, LCD flat screen satellite TV, direct dial phone, safety deposit box, mini bar (upon request), private ensuite bathroom, hairdryer and bathrobes and slippers (upon request). Luxury Travel Diary terms and conditions apply. *This auction item is valued at approximately €752 EUR by Cosmopolitan Hotel & Spa, Kallithea Beach, Paralia, Katerini, Greece – please note this valuation is the list price provided to Luxury Travel Diary by the Auction Prize Provider and should be used as a guide only as cheaper discounted rates may be available. No cash alternative is available. This auction item excludes flights and transport – you will need to arrange your own flights / transportation to and from your home to Cosmopolitan Hotel & Spa, Kallithea Beach, Paralia, Katerini, Greece to coincide with your booking. Your stay is subject to availability, must be booked in advance, and taken between 29 April 2019 to 05 May 2019 or between 14 to 31 October 2019 only. Please note the winner will be required to separately pay for the Occupancy Tax of €3 EUR (approx. £2.60 GBP / $3.65 USD) per room, per night in cash on arrival, as well as for any other additional purchases including further meals, drinks, spa treatments, excursions etc. Please note any associated taxes / resort fees / entrance fees etc. will be collected from the winner by the relevant property at the time of booking your stay or in resort and will not be deducted from the amount bid for the item. Winners must pay for their auction item in full via PayPal within 48 hours of the auction end. The full Terms of our auctions can be found here. To the fullest extent permitted by law, Luxury Travel Diary will not be liable for any loss or damage arising out of the winners’ use or enjoyment of the prize; and the winner acknowledges that Luxury Travel Diary accepts no responsibility whether directly or indirectly for any claims whatsoever arising in respect of the prizes provided by third party providers or sponsors.